After a couple days of furious roasting we decided it was finally time to try all the new coffees and roasts. To pit them in a battle head to head, mano a mano, roast to roast! Well… nothing THAT exciting, but we did break out 3 different kinds of coffee, 4 different roasts, and one kind of weird concoction. From left to right we have: Bali Kintamani, Ethiopa Yirga Cheffe Kochere, Brazil Cerrado (roasted to just past second crack), Brazil Cerrado (roasted just past first crack). 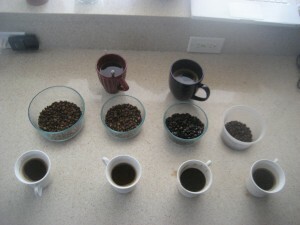 I will go into a little more detail on performing a cupping in a later post, but for now… the coffee! We’re going to be trying a couple new things in the land of ManhattanRoasts over the next little while. The first is a new roaster! Now that we have moved and no longer have a balcony, stovetop roasting is a little more difficult as there is nowhere to cool the coffee and get rid of the chaff (a balcony on a high floor is AMAZING for both). So, we had to find an alternative method of roasting. We’ve used the i-Roast before (the latest model, not the old one, which was apparently crap) and really liked it (even though it was little more than a glorified popcorn maker with heat profiles), but alas they are out of stock and have no plans to produce / release more in the near future. Bummer. So that brings me here. Soon we will . . . → Read More: ManhattanRoasts is Back? Continue reading The Familiar Taste of… Jute? After enjoying a tasty double espresso from Joe The Art of Coffee at Grand Central yesterday (a review will be coming soon), I wandered back up to the office and settled in to listen to Peet’s Coffee’s webcast report of the company’s fourth quarter and year end results. I had expected nothing but doom and gloom from the report, since Starbucks had taken such a hard hit, and consumer spending in general has fallen so dramatically.